Beneath the cobbled surface — Jessica Bodford, Ph.D.
Because our I Amsterdam cards gave us exactly 48 hours -- beginning with the very first swipe -- our first two full days in Amsterdam can be succinctly described as “museum hopping”. We started our morning in the Museumplein (“Museum square”) with the Van Gogh Museum and, right next door, the Stedelijk Museum, which was my first ever contemporary/modern art experience. It’s also the largest museum in the Netherlands, which became readily apparent when -- about 75% of the way through -- we had to fight to keep our legs moving. The Van Gogh Museum, however, was absolutely stellar. One particular portion of the third or fourth floor described the science behind art examination, taking apart exactly what archaeologists look for to determine years, origins, and even the history of a painting. 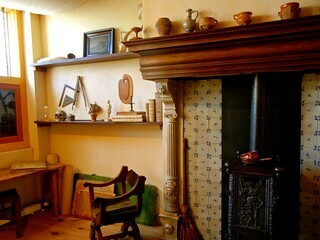 Van Gogh’s original Bedroom in Arles, one of his more famous works, was almost destroyed when Van Gogh’s house flooded. How do we know this? There are a few backwards letters, less than a centimeter in size, that suggest he wrapped up a wet canvas with print newspaper to preserve its paint. I was fascinated; it was like exploring People of the Book in a real-life setting. 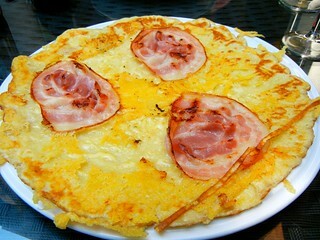 I mentioned earlier that due to Reims’s proximity to the German border but its obvious location in France, much of its food stems from the marriage of both cultures, such as pork-filled baguette sandwiches (croques) and pork-laden flammekueche. and French wines with a Riesling (i.e., German grape) twist. Amsterdam is exactly what you would expect of the Netherlands and its surrounding regions: Its cheapest grub is sausage, bratwurst (the actual, moldy bratwurst), every kind of homemade roll of cheese the size of my torso, and Heineken. So after a 3€ chicken hot dog with (what is either popular in Amsterdam or we had our legs supremely pulled by this guy) Sriracha sauce, curry sauce, onions, and tempura flakes, we headed up into the Plantage district for the Joods Historisch (Jewish History) Museum. This museum was constructed throughout four interconnected synagogues stretching back into the 1600s, and tells the story of the Jewish populations who have originated in, moved through, or remained in the Netherlands. We then headed north to the NEMO Science Center, pictured in my previous post, where it sits along the shores of the IJ harbor. By that point our feet were aching so badly that we had to explore its many areas in five-minute segments, taking frequent breaks to moan and commiserate. It was a kid-oriented museum, very heavy on the interactive front, and just before we left we were able to catch a Rube Goldberg Machine demonstration that took up most of the entrance area and stretched almost two stories high. That evening, we strolled through the Jordaan neighborhood, twisting through alleys and across canals, and by the time morning rolled around, our feet had mostly (sort of) healed. Before the rest of the city had woken, we walked to the bloemenmarkt (literally, “blooming market”), the largest floating flower market in the world. When I read superlatives -- and there have been many on this trip (e.g., among the tallest cathedrals in the world, the largest museum in the world, the best-known landmark in Europe) -- I always giggle when the superlative is clearly a stretch. “The basilica with the most steps to reach it” is an example -- clearly something that an employee sat around pondering just to stick some hint of a claim to fame on their Wikipedia page. The largest floating flower market in the world. Since when have flower markets floated. Forget “largest” -- are there any more out there, and if so, who thought that was a good idea? Regardless, it was a cool sight. We stopped for Starbucks at one end of the market and took our time making our way through, looking through more kinds of tulips than I knew existed (after all, Holland is known as The Land of Tulips…they’re everywhere). Just around the corner was the Rembrandt House Museum, which was a fun take on art exhibitions when exploring a rickety but grandiose 17th-century home. 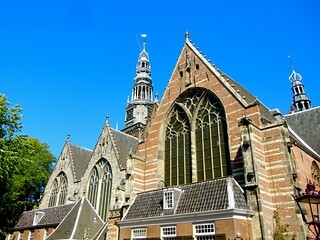 We wandered through Nieuwmarkt, an old square that once housed Amsterdam’s city gate, De Waag. 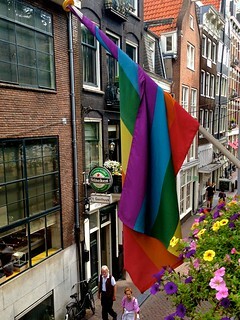 The square sits in Amsterdam’s Chinatown, just around the corner from the Red Light District. A few more turns, and we were standing before what might have been any other house in Amsterdam: a narrow (perhaps 15-foot facade), five- or six-story building attached to its neighbors, with a crooked stoop to invite guests inside. No one would guess that the topmost three stories of this home conceal a hidden Catholic church known as Our Lord in the Attic (Ons' Lieve Heer op Solder). 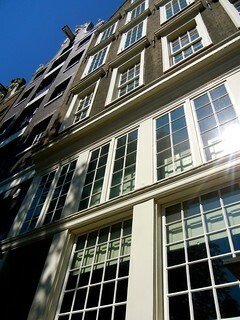 In 1663, a Catholic man bought a home in the newly Protestant Amsterdam, which had outlawed the Catholic faith. Although city officials weren’t dim enough to ignore the wave of 150 parishioners filing into an inconspicuous home every Sunday morning, they were willing to turn a blind eye as long as they didn’t revolt against the Protestant churches nearby. Next, we explored two Protestant churches (formerly Catholic), the Oude Kerk (Old Church) and De Nieuwe Kerk (New Church), built in 1203 and 1385, respectively. Although the styles of each are very similar, I much prefer wood-and-stone interiors to the common French designs of marble, wrought gold and iron, and other grandiose accents. (Maybe that’s just me. I might have been walking through the Chapel of the Cross, if I hadn’t known better.) 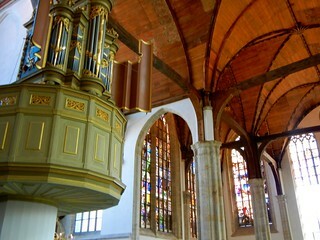 De Nieuwe Kerk, right off Dam Square, is particularly important even in agnostic Amsterdam due to its political importance: It’s the site of royal inaugurations, royal weddings, and the burials of national heroes. We wandered through two upscale shopping plazas (Magna Plaza and De Bijenkorf) that opened off Dam Square, I caved in and bought two small Holland-designed tins of stroopwafels (new favorite guilt), and we made our way to a southern reach of Centruum. I was in search of Begijnhof (not to be confused with Bijenkorf), a square lined with the oldest homes still standing in Amsterdam circa the 1150s…but after meandering around the busy streets, I had all but given up. It wasn’t until a woman emerged from what had previously been a locked doorway in a crumbling stone wall that I saw a snippet of sunlight behind her, and dove to catch the door before it closed. 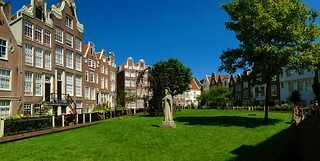 Beyond it was the hidden Begijnhof, a slice of serenity in an otherwise bustling part of town. The homes, not quite as tall nor as narrow as homes from later centuries, seemed to block out all sound so that we might as well have been in another village entirely. A status of Jesus stood in the center of the square, his arms opened in welcome, framed by two churches on either side of the square. 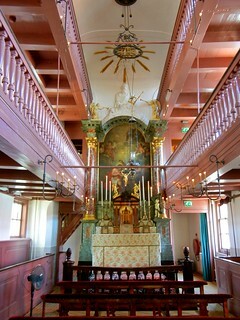 One, the Chapel of the Beguinage, was the result of Beguine retaliation against the newly Protestant rule in the 1660s. It, like Our Lord of the Attic, became a hidden church -- just as difficult to find as the houses around it. The other church, Begijnhof Chapel (ca. 1397), is a former Roman Catholic church that is now considered an English Reformed Church. Not sure what that means, but the Queen has visited in the last decade or so, and that’s pretty darn awesome. Right around the corner of the square stands Amsterdam Museum, which is surprisingly interactive considering the nature of its content. (It’s easier to play with electricity in the NEMO Science Center than to play with snippets of the city’s history.) I can say that I learned one particularly interesting fact about Amsterdam: It was the first European country to establish an Internet connection, and was the first country in the world to set up a functional (and widely used) online community, which was called De Digitale Stad (The Digital City). That evening, thoroughly museumed-out after making a half-hearted attempt at the renowned Biblical Museum, we wandered and haggled our way through Waterloopleinmarkt (and I scored a cute blouse and harem pants), gave into our sore need for Asian food (in my case, after more than a month without it) at an inexpensive Thai restaurant close by, and finished the night with free Wi-Fi at Café P 96, where we sat out by the canal and people-watched until the sun had set. 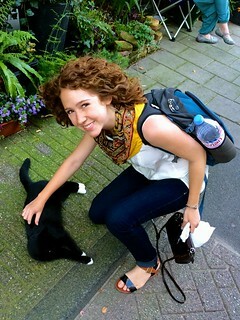 I’m going to end with the simple statement that Amsterdam residents have incredible calves. 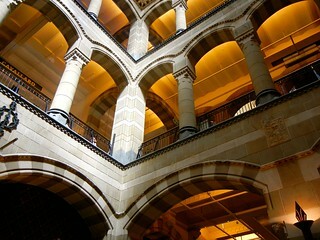 They have to: Each and every staircase is as steep as a ladder, with steps as narrow as rungs. (I have to descend them sideways, and my feet are only a size 7.) Each step is the height of two steps in America, and each turn -- which are inevitable in tall homes as narrow as these -- is a death wish. I write this from St. Albans (Hertfordshire, a 45-minute drive from London), which is riddled with enough hills to highlight just how much the flat desert has spoiled both of us. With every ascent, our calves still ache from so many encounters with these Amsterdam stairs.